The Quaide Milleth International Academy of Media Studies (QIAMS) has been established by QUEST (Quaide Milleth Educational and Social Trust) to produce dynamic media professionals who have imbibed democratic, secular and ethical values. The courses at QIAMS are contemporary and tailored to meet the needs of the vibrant, consistently evolving media industry. At QIAMS, students will learn to use state-of-the-art technology and learn software used by the leading media houses. They will also be trained by teachers who have decades of experience in the media industry. Do you dream of becoming a media professional? Come and join QIAMS, where experienced professionals are waiting to help you fulfil your dreams. You can fulfil your dream in just 6 months! Or at the most in just 1 year! Maybe you are concerned that you haven’t had any exposure to media studies so far in your life. You needn’t be. IT DOESN’T MATTER WHAT YOU HAVE STUDIED—our courses will suit you perfectly because they are tailored to take you from being a novice to a high level of expertise. Maybe you have already completed VISCOM, but you are sick and tired of searching for a job ever since. OUR 1-YEAR COURSE WILL BE PERFECT FOR YOU. You will leave our academy completely ready to play a significant part in the visual media industry. OUR COURSES WILL INCLUDE INTERNSHIPS, where you will get the chance to network with leading media professionals and learn the latest technology that is used in the industry and much more. You will also find that our syllabus is modern and teaches everything you need to shine in the industry today. So whether you are a novice or an advanced media expert, QIAMS CAN HELP YOU GET VERY FAR IN LIFE. Join us, and get equipped to become a broadcast journalist, an online news developer, a VISCOM professional, a newspaper reporter and much, much more. Don’t miss out! Hurry and take advantage of this wonderful opportunity! Experienced media professionals have joined QIAMS as faculty. Their presence and the dynamic syllabi that they have prepared will ensure that students will be fully prepared to join the fast-evolving media industry. QIAMS faculty will train students in the latest software and media production techniques that are used in the industry today as well as in current affairs, economics, history and the other core fields of study in journalism and mass media. Internships have also been integrated into the courses at QIAMS. These internships will be at reputed Indian and foreign media institutions, with whom QIAMS has made arrangements for tie-ups and close collaboration. These institutions include Doordarshan, Raj TV, Anna University, Jamia Millia Islamia and Maulana Azad National Urdu University. The internships will provide students with a sound understanding of the functioning of the media industry and equip them to enter the industry as competent media professionals. The media industry has experienced tremendous growth over the last two decades and this is expected to continue in the future. India now has over 1,00,000 newspapers, around 1,000 news channels and an online daily news readership of around 9,40,00,000. Beyond the news industry, media professionals also have vast opportunities in the information technology, animation, filmmaking, and several other sectors. Thus, students who complete the courses offered at QIAMS can become not only print, broadcast and online journalists, but also visual media professionals, art directors, copywriters, camerapersons and documentary filmmakers. There is a clear need for well-trained journalists to report on local issues. This is only possible when journalists are effective communicators in the local language. As it stands today, all institutions teaching journalism in Tamil Nadu teach the subject in English. QIAMS will be the first mass media and journalism institution to train students using both English and Tamil as the medium of instruction. Students will thus be able to enter both the English and Tamil media industries at the completion of their courses. QIAMS hopes that this will ensure better coverage of Tamil Nadu-related issues as well as increased job opportunities for the students at QIAMS. The best platform to enhance your knowledge and learning. 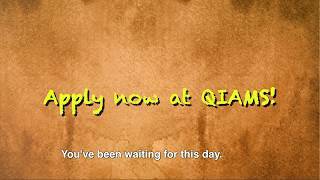 QIAMS - Quaide Milleth International Academy of Media Studies.